Want to study in UK but you are unsure of how to go about it? 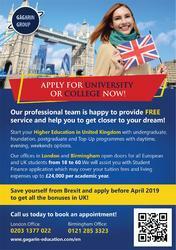 Gagarin Group offers free assistance with the application process for those interested in studying in the UK. We have a wide range of partnerships with universities from London, Birmingham, Manchester and Leeds. We are based in Birmingham City Centre and we are open from 10AM to 6PM. Our address is 43 Temple Row, Birmingham, West Midlands, B2 5LS, United Kingdom.